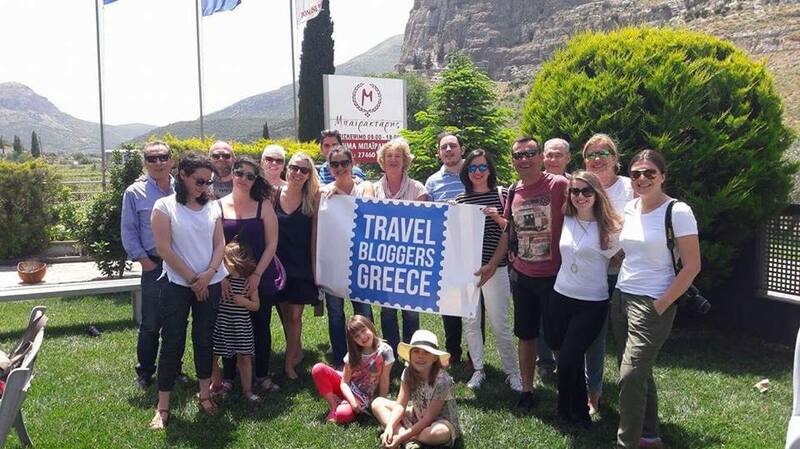 In May 2017, the members from Travel Bloggers Greece were invited to join a full day wine experience in the famous wine producing region of Nemea organized by Greece2taste. 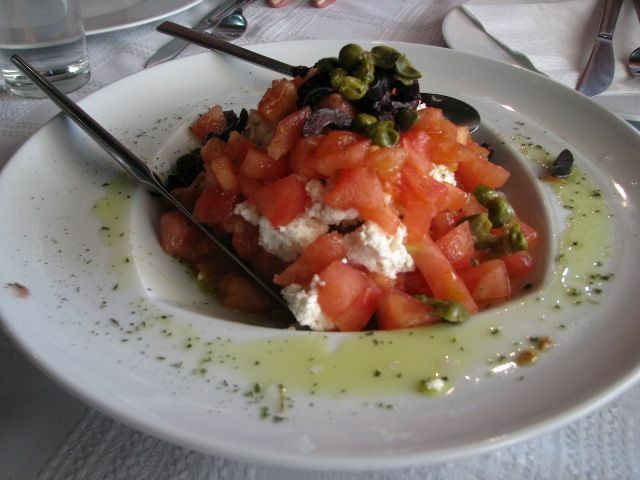 Greece2taste was founded by a group of friends, all food and wine enthusiasts with experience in several aspects of Greek gastronomy. Nemea is an ancient site in the northeastern part of the Peloponnese. It is also the name of one of the most historic wine regions in Greece. 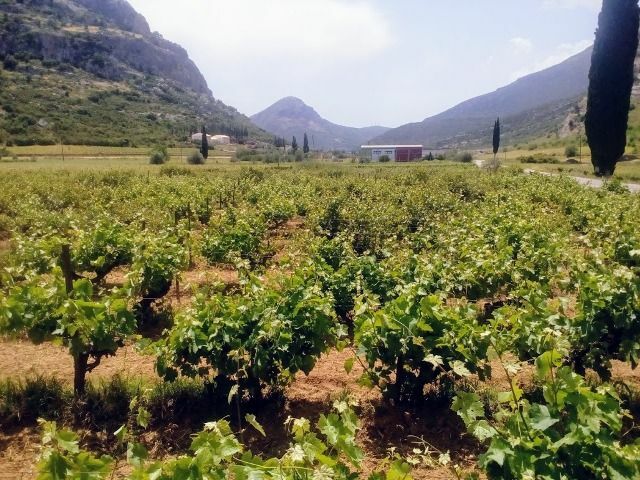 The first reference to the wine tradition of the Peloponnese came from Homer who called it ‘Ampeloessa’, meaning “full of vines.” The vineyards of the Peloponnese are known for their diversity and complexity. 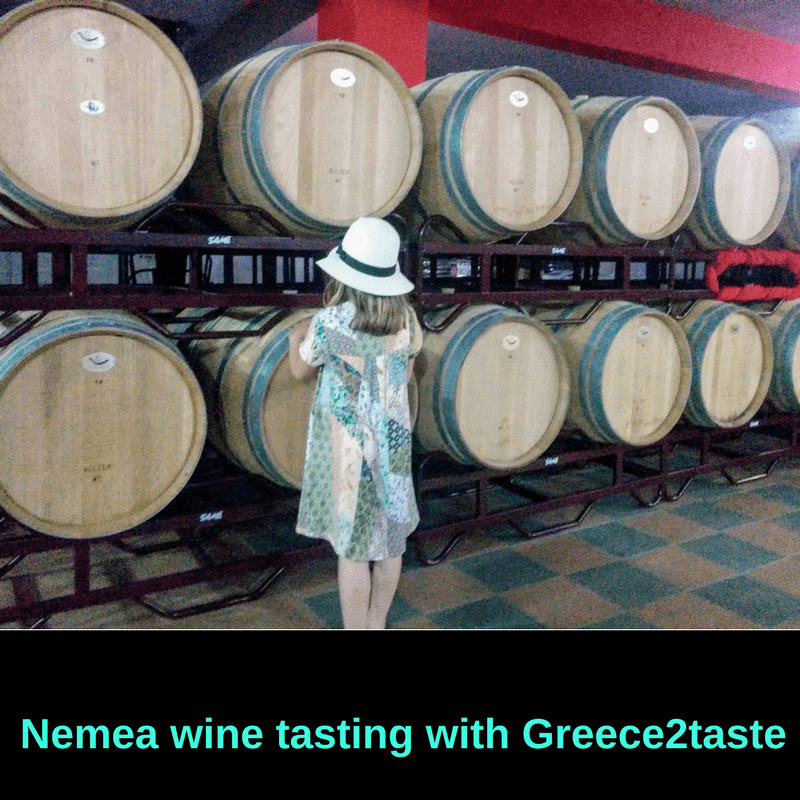 Nemea is the most important AOC region in southern Greece for the production of red wines and the Agiorghitiko grape. 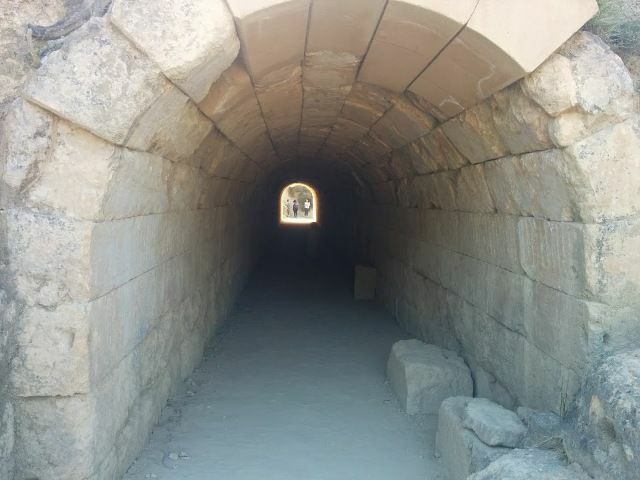 Nemea is 1, 5 hours away from Athens. Greece2taste picked us up with a tour bus from our meeting point in Athens and drove us straight to Nemea. Group tours, as well as small private tours, are possible. It was comforting to know that we did not need to drive back home after a day of wine tasting. Our children joined as well and they had much fun on the bus. During the one and half hour bus ride, Panos, from Greece2taste, give us an interesting introduction in English on the wine production and the region that we were about to visit. 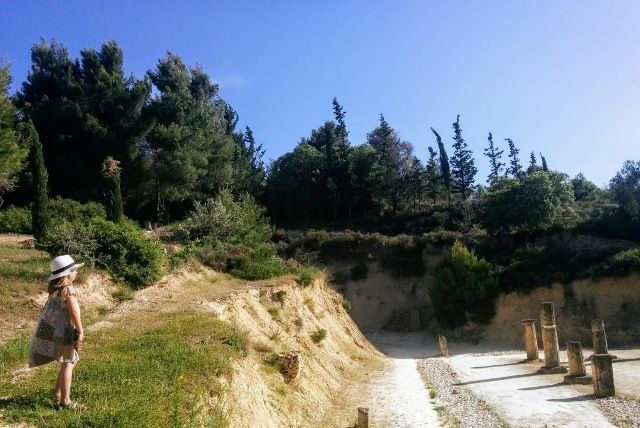 The first winery that we visited was Domaine Bairaktaris beautifully located at the entrance of Nemea at the foot of a small but impressive mountain range. The children immediately run off to the beautiful enclosed garden at the estate. There was lots of shade there for them to play. 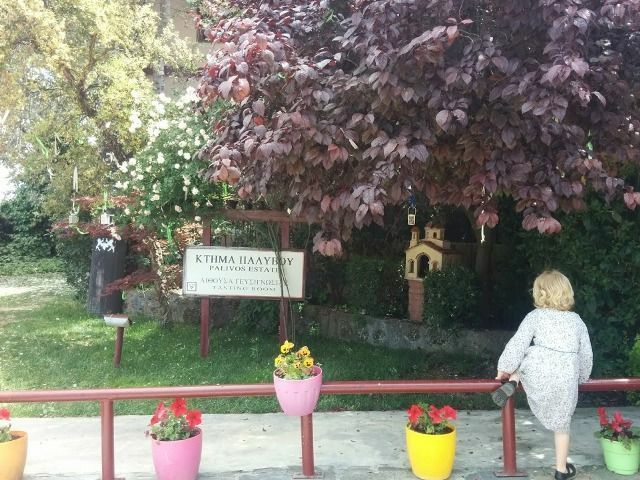 We were welcomed by Yiannis, one of the heirs to the Bairaktaris winery. He explained us the history of the family business and the way they produce wines. 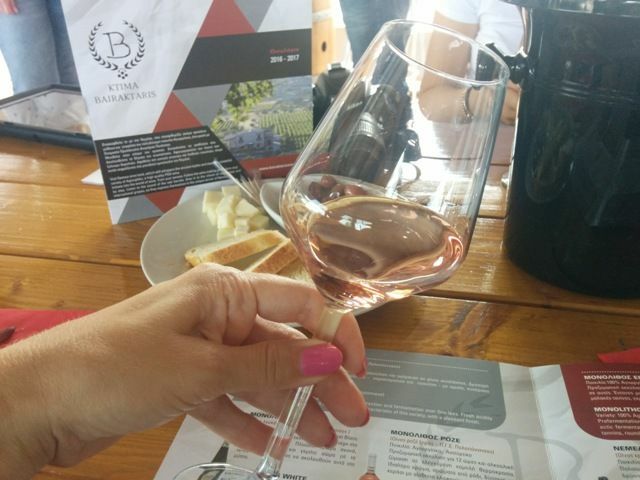 The goal of the Bairaktaris family is to produce wine with original flavors and fragrances and therefore no yeast or chemicals are being used. 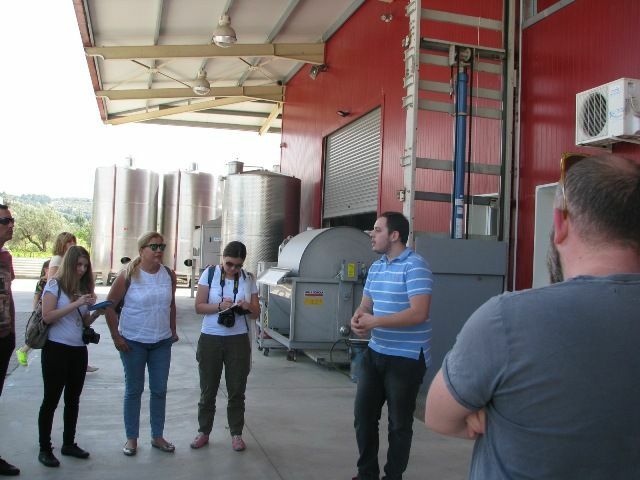 We were guided through the whole process of winemaking and had access to all parts of the production line. 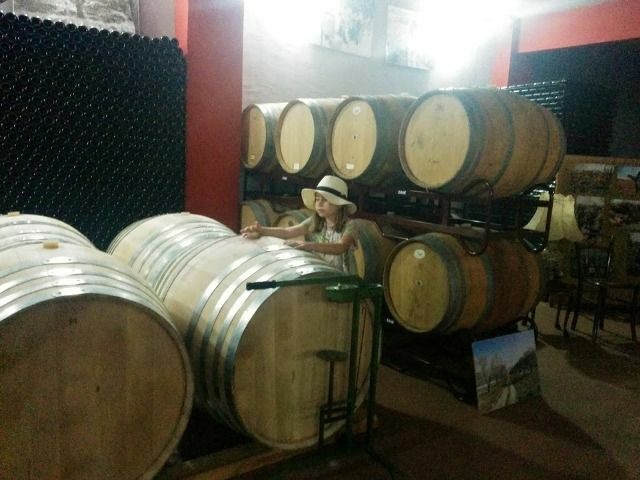 We also visited the wine cellar where the children were impressed to see the large barrels and many bottles. After the tour, we were guided to a modern patio next to the garden. A table with mezze was waiting for us. And we started a very well organized wine tasting of five wines accompanied by helpful explanations and background information by Yiannis. There was time for questions and taking notes. Some of us had previously joined a Wine Tasting Evening with Greece2taste. Our notes and checklist from this seminar were helpful to access the wines that were tasting today. 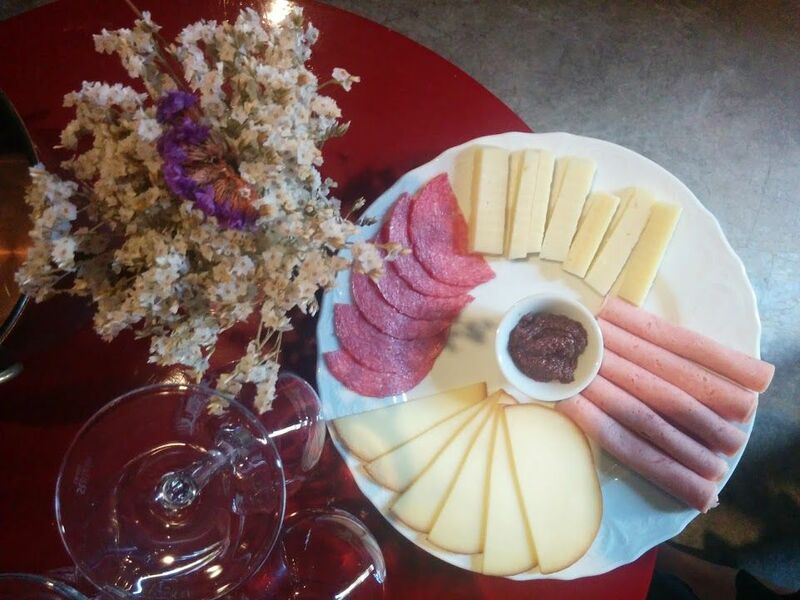 It was fun and relaxing tasting with my friends while the children were happily playing nearby. Our second stop was at the Palivou Estate. A table with crayons and paper was waiting for the children to be entertained in the lovely garden of the winery. 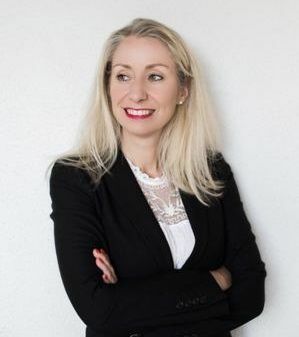 When the kids were happily drawing, we were welcomed by our host Katerina, a member of the Palivou family. We followed her through the garden to the vineyards. In the garden we saw an actual cork tree! Our visit at the romantic Palivou Estate was different from the first winery and I liked that a lot. In domain Bairaktaris we saw a modern winery and saw the production. Palivou Estate had a more traditional character and appearance. The information that we received on both wineries did not overlap but complemented each other. 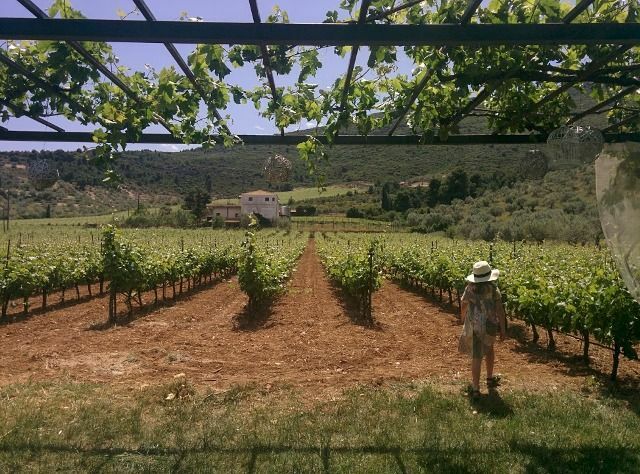 By visiting the vineyard, we found ourselves in the heart of the Nemea wines. We touched the soil and admired the views over the vineyard. We had a wine tasting here as well. This time inside the traditional wine cellar. The wine that we tasted was accompanied by local mezze. It was nice and cool inside the wine cellar, a welcome break from the heat of the vineyards. 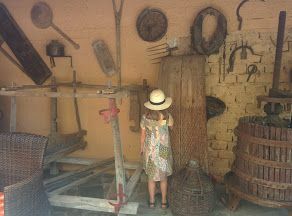 In the meantime, my children admired the old tools and traditional machines at the grounds of the winery. It looked like a small museum! Feeling happy and a bit dizzy from visiting the two wineries and tasting their wines, we got back on the bus and headed to the center of the Nemea village for lunch at Sofos restaurant. We were promised a culinary experience, and indeed we had one! Lunch at Sofos restaurant was very good. We were served local dishes to compliment the wines of the region. More red wine was tasted during lunch. 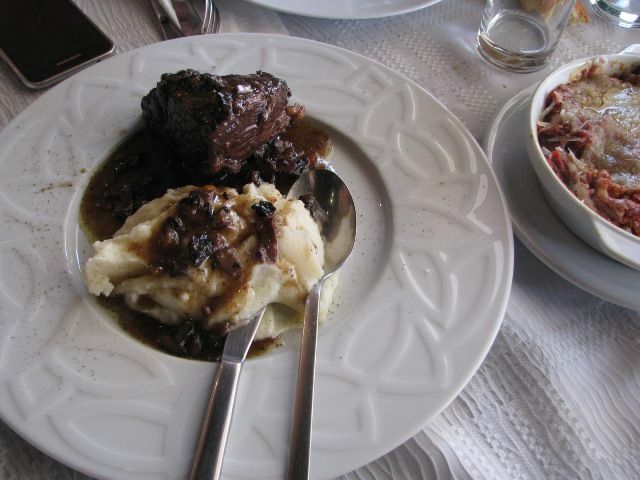 We had a choice of two salads, a refreshing rusk bread salad, and a green salad, baked aubergine with cheese, tender beef served with mashed potatoes and – my kids favorite – chicken with pasta. Dessert was a caramel custard. 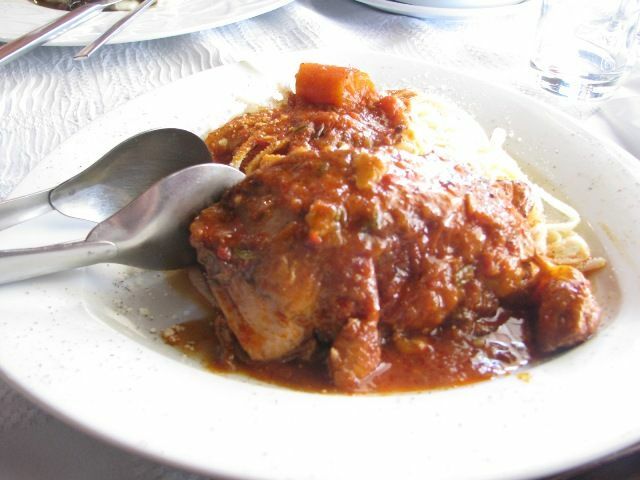 You can read more reviews on Sofos restaurant here. We had plenty of time to eat and to relax. The restaurant was spacious and had lots of daylight. The children of our group were dedicated their own table. Kids happy, parents happy! After lunch, there was time for a Greek coffee at the local coffee house on the village square. My children choose an ice cream at the kiosk instead. 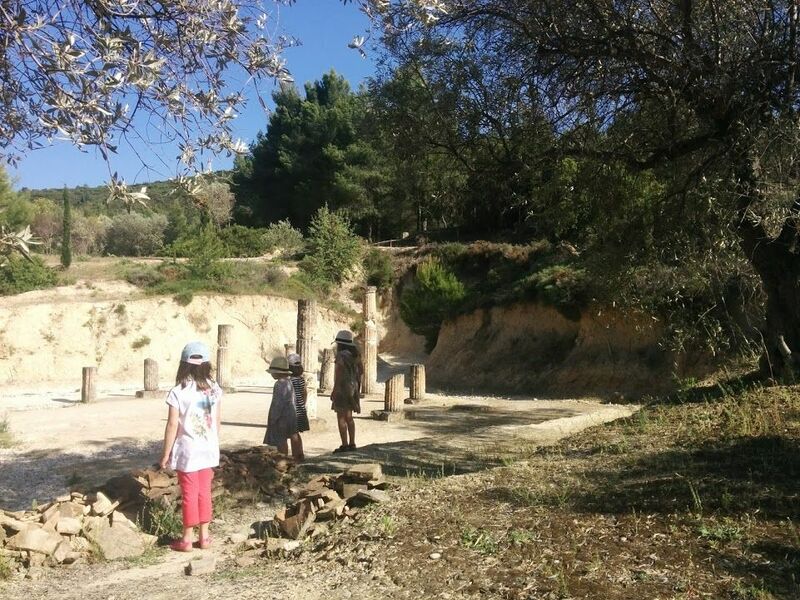 The lunch break gave us new energy for the second and last part of our trip: a visit to the archeological site of Nemea. Being a huge enthusiast of (ancient) history and archeology, I could not feel happier for this part of the tour. It was very peaceful at the site and the energy could clearly be felt. 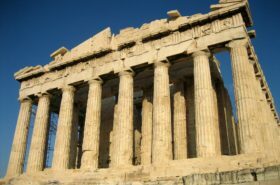 I believe that a wine tasting in Greece needs to be connected to ancient Greece. Wine is known to have played an important role in ancient Greek culture, religion, family, and society. The wine was integrated into philosophy, religion, art, poetry, music, and more. Nemea was a religious sanctuary where pan–Hellenic athletic games, or Nemean Games, were held every two years from 573 BCE until 271 BCE. These Games took place every two years and included music, theater, and athletic events. Leonidas from Greece2Taste guided us around the site. 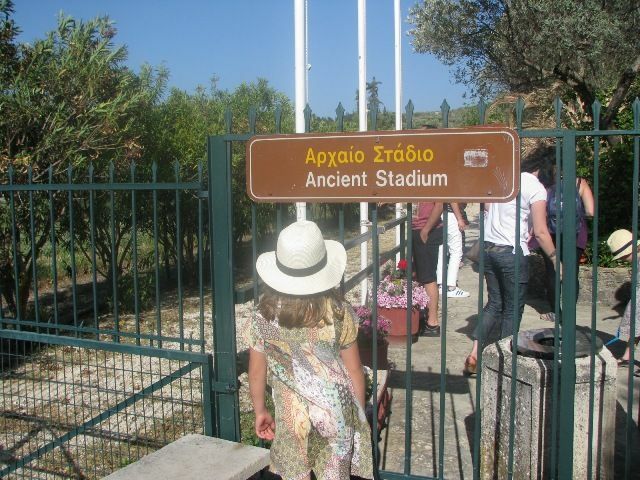 The ancient stadium was very impressive. My kids felt like an athlete in ancient times running around the track and field. You can also see the long corridor here through which the athletes entered the stadium. 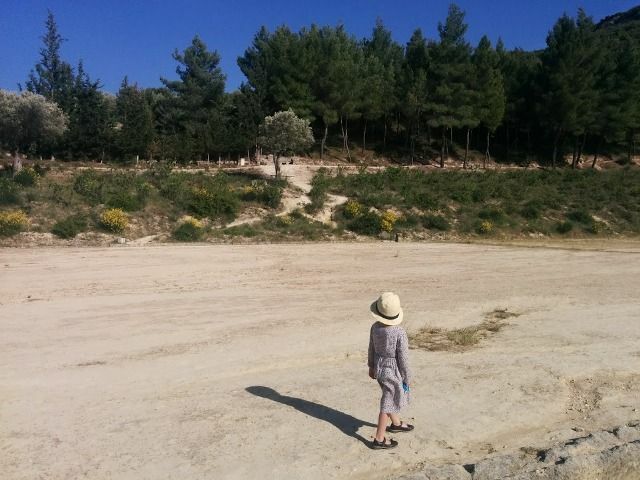 We returned back to Athens after a long full family day in Nemea. Wine is such an important part of Greece’s (ancient) history, culture, and culinary tradition. 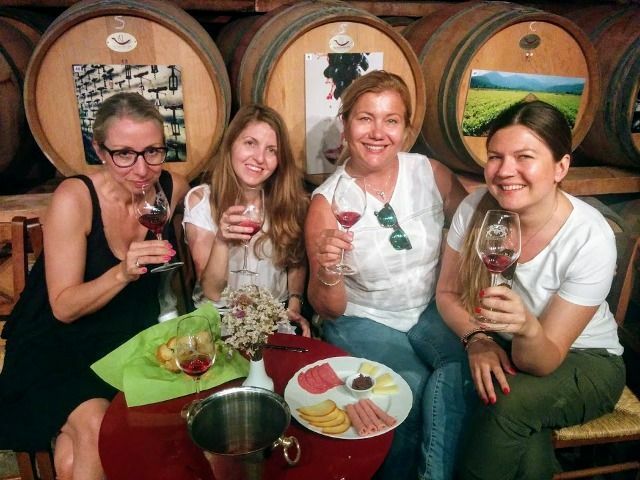 If you want to learn more about Greek culture or if you are a wine enthusiast, if you want to have an interesting day out with friends or family, than a wine tour with Greece2taste is much recommended. The tour offers a full day out with fabulous wines and food, education, history and a great team of people. Children are welcome and the bus will bring you back safe to Athens. You can also purchase wines at the wineries to bring home. 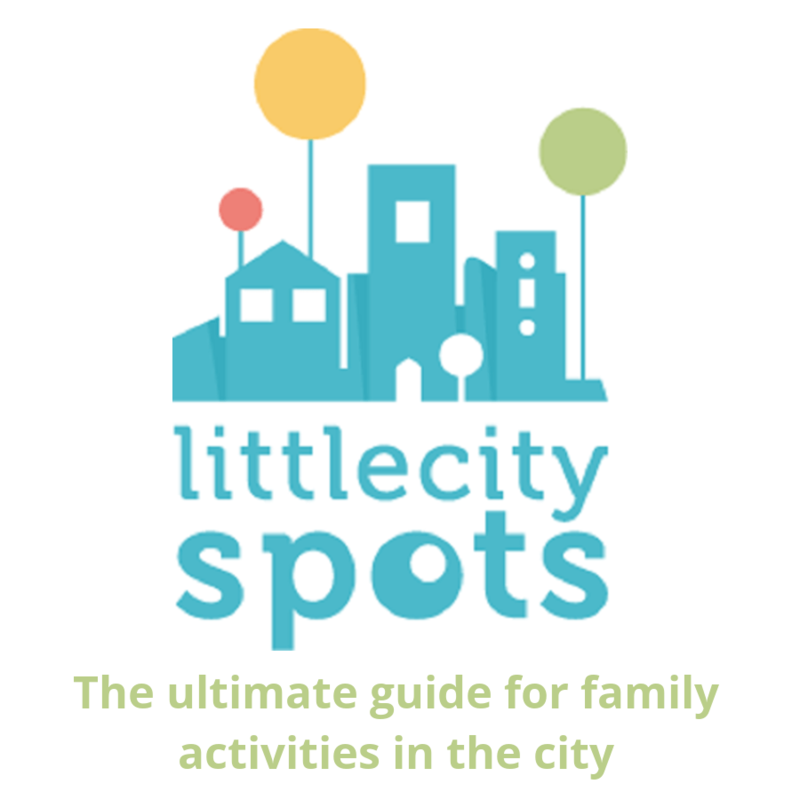 Did you like our family experience? Pin it for later!